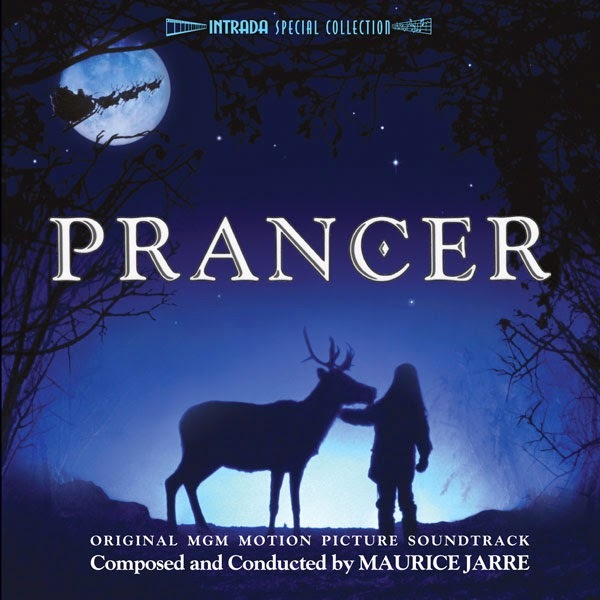 When composer Maurice Jarre was hired to score the elements of magic, childhood, and Christmastime in the 1989 MGM film Prancer, he rose to the challenge with panache. Jarre uses colors that capture the tone and almost storybook-like elements of the film, prominently featuring the EWI (electronic wind instrument) which becomes the main solo wind voice—often representing the magical, otherworldly presence of the eponymous reindeer. Another featured color is the Celtic harp, which gives the score rustic warmth -- a sound both ancient and intimate, and Jarre used it to perform the score’s main themes solo or to provide little embellishments. The rest of the palette is comprised of solo piano, strings, and synthesizers, blending together to form a musical character both contemporary and timeless — and thoroughly Jarre. Almost the entire score plays in major keys and reflects the beauty and warmth of the Christmas spirit. The composer wrote two main themes for the film. One is for Prancer: a gliding, lyrical melody that rises and rises in its first half, then gradually falls, alighting on a series of descending chords. The other central theme is for the loving bond that develops between Jessie and Prancer. To present this premiere CD release, Intrada was fortunate to locate the original stereo session mixes made onto DAT, and presented here just in time for the Christmas holiday. With her mother dead and her father (Sam Elliott) in a constant state of anxiety over the future of the family apple farm, Jessie (Rebecca Harrell) looks for hope and miracles in the Christmas season and particularly in Santa’s flying reindeer. Soon after her small town’s decorative Prancer falls off its wire and gets run over by a car, Jessie and her father discover a real wounded reindeer in the woods. Jessie hides what she thinks is the genuine Prancer from her shotgun-wielding father and nurses the animal back to health. The town eventually discovers her yuletide secret—which she hopes to return to Santa on Christmas Eve. Her sunny faith and innocence bring warmth back into the life of a resident crank (Cloris Leachman) and, eventually, her own home. Just Announced, just in time for the holidays!